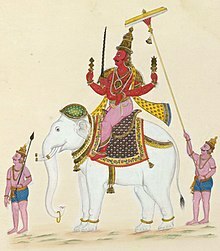 Indra (/ˈɪndrə/, Sanskrit: इन्द्र) is a Vedic deity in Hinduism, a guardian deity (Indā, Pālī) in Buddhism, and the king of the highest heaven called Saudharmakalpa in Jainism. His mythologies and powers are similar to other Indo-European deities such as Jupiter, Perun, Perkūnas, Taranis, Zeus, and Thor. ^ a b c d Thomas Berry (1996). 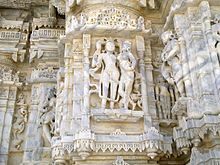 Religions of India: Hinduism, Yoga, Buddhism. Columbia University Press. pp. 20–21. ISBN 978-0-231-10781-5.